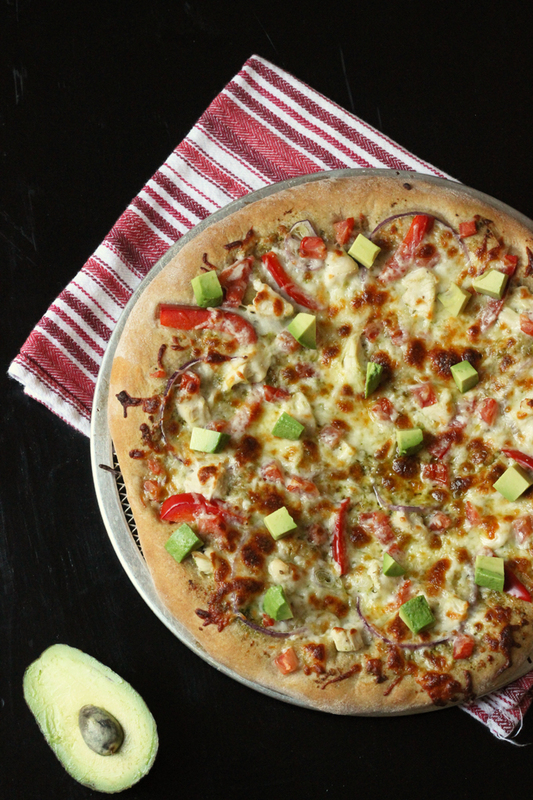 Enjoy a healthier pizza night this week with this homemade Chicken Pesto Pizza with Fresh Avocado featuring a whole wheat crust. It used to be that one of my children requested Costco pizza on a weekly basis. And on a weekly basis, I said no. Though it was once a our “go-to” pizza for almost two decades, our (hubs’ and mine) recent adventure in calorie counting has struck Costco pizza from the list. With one slice topping 500 calories, it’s just not worth it to us. Especially when I can make a personal-size pizza with whole wheat crust for fewer calories. Not only is my version less fattening but it tastes better and contains much more nutrition. So, now that homemade pizza is a regular thing, the aforementioned child requests pizza on a weekly basis. And he gets really wigged out if I have something different on the meal plan. Good thing I know how to make a healthier pizza. In our calorie education hubs and I learned to measure out toppings, like cheese or chicken. We realized that we were just as satisfied with an ounce of cheese as we were with several handfuls. Who knew? Not only is measuring a great way to reduce calories, but it’s also a fair means to using less and thereby saving money. 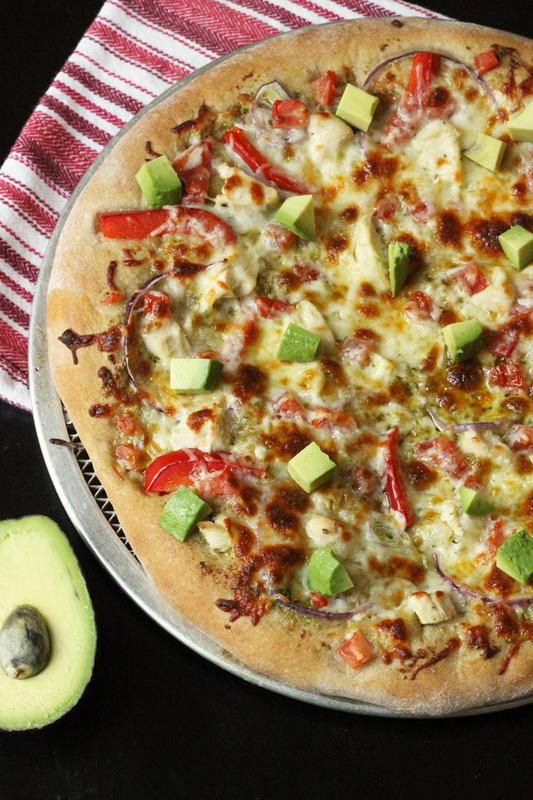 One of our favorite healthier pizzas is this Chicken Pesto Pizza with Fresh Avocado. 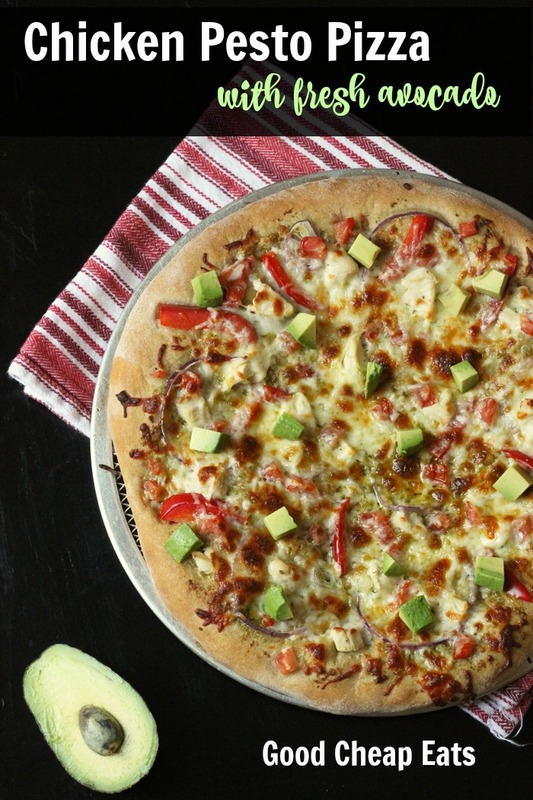 With a whole grain crust, pesto sauce, chicken, and lots of fresh vegetables, it’s a winner! I love adding avocado to a pizza after it’s been cooked. Gives it a nice dose of healthy fat and a boost in flavor. Have you tried it? You must! Often I make my own pesto or this Rustic Basil Sauce, but on a Friday night when I’m tired, I’m happy to lean on Costco’s Pesto. It’s delicious and a great deal. Feel free to use your favorite pesto-type sauce. Stock up on ingredients when they are on sale. Whether it’s chicken, pesto, or avocado, track prices and stock up on great priced items. Shop Costco. Costco has the best price on shredded mozzarella as well as pesto. I buy the big five pound bag of cheese and divide it into smaller bags to store in the freezer. The jar of pesto lasts several weeks and we make all the pesto things when we buy a jar. This is a pretty straight-forward dish. You don’t need any fancy equipment. However, having some good basic kitchen tools can really make your time in the kitchen more enjoyable. Over time, I’ve honed my collection so that they are perfect for my needs. I actually have an arsenal of favorite pizza tools that make the Friday night pizza experience super quick and simple. A kitchen scale – to weigh flour quickly, much more quickly than when I use a measuring cup. A KitchenAid mixer – I used to use a bread machine, until the 4th — or was it the 5th? machine in 14 years broke. My KitchenAid, circa 2004, has served me well since then. A large plastic cutting board – I use this to work my dough. A bench knife – for dividing the dough easily into portions. Round pizza screens – I have a collection of different sizes that work really well for me. Preheat the oven to 475. Spray two 12-inch pizza pans with non-stick cooking spray or line two baking sheets with . Form the dough and stretch to fit the prepared pans. You can make two medium pizzas or 4 small personal size pizzas. Divide the pesto evenly over the rounds, spreading to the edges. Layer on the toppings: chicken, vegetables, and cheese. Bake for 8 to 10 minutes or until the dough is crisp and the cheese is melted. Remove from the oven and slice. 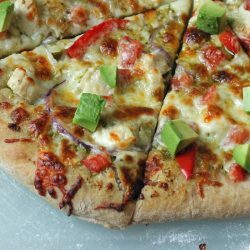 Top the pizzas with fresh avocado. Originally published October 10, 2012. Updated April 22, 2017.
i want to try this but my tummy cant tolerate cheese, what can i substitute with that? You could make it without. There’s very little cheese anyway. And the other flavors are so good, it’ll be fine without it. Yum… that looks fantastic! I’m really going to have to find myself a gluten free pizza crust mix.. I did hear of a nearby pizza place carries gluten free dough you can take home to make your own.. That’d be awesome! @KimH, We really like Bob’s Red Mill pizza crust mix. One bag of mix will make 2 9×13 pans full of pizza (I usually freeze half the dough for later). It’s kind of funny to work with if you’re used to gluten dough, but if you follow the directions exactly, it works and it’s really yummy! I loved this crust recipe! I make pizza from time to time and this is the best crust I have made! Thanks! I substituted marinated shrimp because I live on the coast and it was super fresh. This was a great recipe for my family because I was able to make one side of our pizza how my husband liked it (he refused to eat veggies) while still enjoying veggies (all of them!!) On my side. Great recipe!